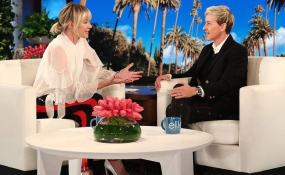 Portia surprised her wife Ellen with the Gift of a Lifetime: The Ellen DeGeneres Wildlife Fund that will support the Dian Fossey Gorilla Fund’s permanent home in Rwanda. The ground-breaking ceremony of the long awaited Ellen DeGeneres’ Campus of the Dian Fossey Gorilla Fund begins next week, and officials say the campus could create more than 1,500 jobs during the construction process. “We estimate that 1,500 jobs will be created (with 40 per cent of the workforce being female) and $2 million spent on local labor and trades. In addition, we estimate that $2.5 million will be spent on local materials gathered from within 250 km of the site,” Felix Ndagijimana, the Director of the Dian Fossey Gorilla Fund International, told Sunday Times. Since then, Ellen who’s also passionate about animal conservation, has been raising awareness and mobilising resources to boost her efforts to create the first and the largest campus that will focus mainly on research that has to do with conservation of the endangered mountain gorillas. The Fossey Fund is the world’s longest-running and largest organisation dedicated entirely to the conservation of gorillas. “The Fossey Fund’s Karisoke Research Center is currently based out of a rented facility lacking in adequate and appropriate space for our operations,” said Ndagijimana. “It is also located some distance from the Volcanoes National Park where our activities occur. Thus, we are building a permanent, purpose-built campus closer to the park called the Ellen DeGeneres Campus of the Dian Fossey Gorilla Fund”. The current building sits 30 kilometers away from Volcanoes National Park, where Fossey Fund’s daily gorilla protection and science work takes place. According to Ndagijimana, the campus will include state-of-the art science laboratories, space to hold key partner meetings, classrooms for educational programming, a dynamic and interactive museum that focuses on Dian Fossey’s story. Dian Fossey’s museum is expected to act as a key attraction for tourists as well as an educational facility for local communities. The campus will also have living laboratories that illustrate key ecological concepts, such as reforestation or citizen science, as well as dormitories to host university students. “This campus will expand our ability to be a key node in the Rwandan’s government’s Center of Excellence in Biodiversity Conservation and Natural Resource Management. We feel it demonstrates our continued investment in advancing the conservation and science goals of Rwanda but will have an impact much beyond that – it will be a significant investment in the local communities around Volcanoes National Park,” the Fund’s Director, said.